Think Walker will take that fresh PR mugging, plus his big jobs promise fail, and our wrong-direction plunging pothole index on his 2020 Presidential tour, with stops upcoming in MD and VA? 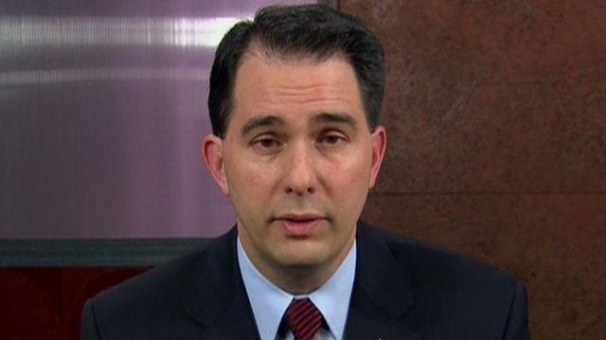 More definitive proof that Scott Walker did bang his head on a kitchen cabinet and it not only caused his massive shiny bald spot, but it severely rattled his pea-sized tiny brain. I'm no Walker fan, but from what I understand, this drop was expected as 2016 was the first year when ALL Wisconsin juniors took the ACT test, rather than the lower percentage of college-bound students who took it in previous years. Similarly, the national average declined because SEVEN states made the same change. Why? I don't know. But comparing 2015 to 2016 is comparing apples to oranges. Walker has degraded public education and the teaching profession in WI, offering little to boost college readiness. Well no matter how low ACT scores go here or anywhere else, they will still exceed the IQ of this crooked-faced koch hack. Unfortunately, the only lower numbers come from the large base of even more stoooopid people that get their poor education in Wisconsin and then raise poorly educated children. Donald Trump may thank the poorly educated, but they are really stooopid and Scott Walker panders to them. Wisconsin Politicifact: "The state Democratic Party said Wisconsin dropped "from second in the country to 41st" among states where more than half the students took the ACT college preparation exam. The party admits it erred, by comparing scores of two different groups of students. In fact, Wisconsin ranked second in the 2014-’15 ACT testing among states where more than half the students took the exam, not 41st. For a statement that is false and ridiculous, our rating is Pants on Fire." Yea-I really believe everything that Politi-CRAP says. Same group that legitimized Walker's fictitious claim in his book that he was viciously attacked by union thugs in LaCrosse. Total LIE but Politi-CRAP rated his claim 100% True. The fact is that in ONE YEAR, Wisconsin dropped from 2nd in the nation where all students take the ACT to 4th in the nation. Wisconsin ACT scores are in a literal downward free-fall that will not stop for years. Exactly what the Stand With Walker supporters wanted. As a Wisconsin science teacher it is no surprise to me that Wisconsin students' ACT scores are PLUMMETING. Over half of the science and math teachers in our district have either retired, fled the teaching profession, or left for districts that still respect and compensate teachers as professionals. With few exceptions, their replacements are brand new teachers, often with minimal educational backgrounds. My district votes 80% Republican every election. Nice to see the children of these reliable Republican voters are experiencing the decline in educational quality that their parents and grandparents have supported for years. All of that is true, and with horrifying racial gaps on top of it, but focusing on the total ACT scores is misleading because all students had to take the test last year. this is not an attack on education as much as it is on the teachers union. After all who wants to be an underpaid underbenefited indentured slave to Mr. Walker. I found out that MPS, which I assume is the state's largest district, had already mostly been testing all juniors. Here is an article from 2014 that explains the MPS situation a bit more. It says that in 2010, when MPS went to daytime testing, the scores dropped a bit, but by 2014 were rising again. I didn't see where it indicated how much they dropped. Sort of complicates the current situation a bit, if MPS was already testing most juniors and was increasing the scores, at least in 2013 and 2014.